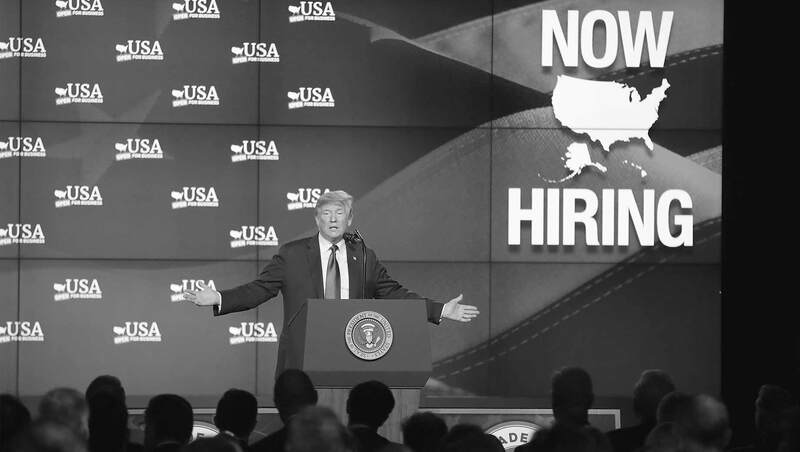 WASHINGTON, D.C. -- President Donald Trump continues to receive positive marks for his handling of the economy, with a 53% approval rating in early November. His ratings for handling foreign affairs, immigration and healthcare are significantly lower, with a majority of Americans saying they disapprove of his performance on each. This latest update of Americans' views of Trump are from a Gallup poll conducted Nov. 1-11, including interviews conducted both before and after the Nov. 6 midterm elections. 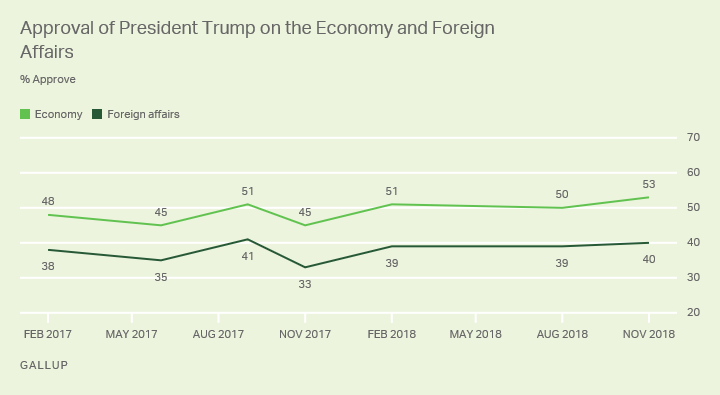 The economy and foreign affairs are two basic issue-approval ratings Gallup has updated seven times since Trump was elected. Although these ratings have fluctuated from survey to survey, the gap between the two approvals has been constant, with Trump's economic approval rating averaging 11 points higher than his foreign affairs approval rating. Trump's current 53% approval on handling the economy is by two percentage points the highest he has received so far. His 40% foreign affairs rating is one point lower than the 41% he received in September of last year. Trump's last two ratings on handling the economy -- 53% now and 50% in August -- are well above the average of 45% on this economic approval measure across presidents extending from Ronald Reagan through Barack Obama. By contrast, Trump's foreign affairs rating is well below the historical average of 50%. Americans' views of Trump's handling of immigration -- arguably the most significant policy issue of his administration to date -- have not varied much, ranging from a high of 42% approval in February of last year, shortly after he took office, to 38% in August of this year. The current 40% approval is right at the average for the six times Gallup has measured Trump's handling of the issue. Gallup has measured Americans' views of Trump on healthcare policy only twice before now. His current 36% approval rating is low on an absolute basis but higher than the two times it was measured last year. The increase from a year ago was propelled mostly by more positive views of Trump's handling of healthcare among Republicans and Republican-leaning independents; Democrats' attitudes have shown little change. The gap between Republicans' and Democrats' views of Trump's handling of issues is just as evident as is the case for Trump's overall approval rating. Both Republicans and Republican-leaning independents as well as Democrats and Democratic-leaning independents give Trump his highest ratings on the economy, with 91% of Republicans approving, compared with 21% of Democrats. That still leaves a 70-point partisan gap, roughly the same as for the three less-positively evaluated issues. Republicans' 74% approval rating for Trump's handling of healthcare is their lowest of the four issues tested. Democrats' approval of Trump's handling of foreign affairs, immigration and healthcare are in the single digits. Americans' relatively high approval ratings for Trump's handling of the economy reflect the public's overall positive sentiments on a number of economic indicators, including some readings that are as high as or higher than they have been in at least 18 years. Trump's rating on handling foreign affairs, on the other hand, is significantly lower than his economic rating. That is a fairly unusual situation, as more often than not, previous presidents had foreign affairs ratings equal to or higher than their economy ratings. Trump's relative positioning on these two issues is most reminiscent of Bill Clinton's second term, when his economic approval rating soared much higher than his rating on foreign affairs. At that time, however, all of Clinton's approval ratings -- overall job, economy and foreign affairs -- were higher than Trump's are now. Trump's approval ratings on the two critically important policy issues of immigration and healthcare are relatively low and are little changed so far in his administration.